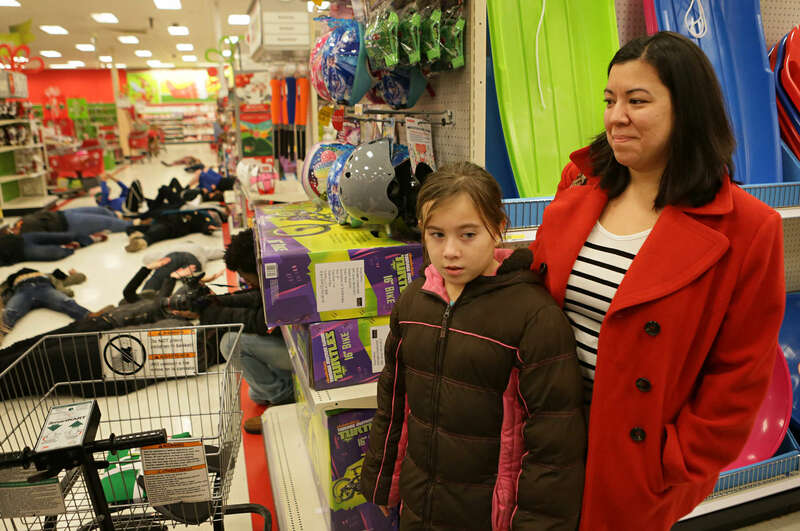 Amelia Alonzo, 9, and her mother Tracy Alonzo look over an aisle where protesters were holding a 4.5 minute die in at the Target in St. Louis County off of South Lindbergh Boulevard on Sunday, Nov. 30, 2014. "We're explaining to her that people need their voices to be heard and that there is nothing scary going on here" said Tracy Alonzo "We support the protesters, I was was excited to see them here". The protesters marched around the store and chanted for 20 minutes before leaving. Other shoppers had a different reaction to the protests and were visibly shaken by what they saw and heard. Earlier the protesters also marched and chanted in the Walmart off of Telegraph Road. Both stores announced they were closing early and police ordered the protesters to leave, which they did.